Size 3 - £64.99 Only 4 left! Size 4 - £61.99 Only 5 left! Size 5 - £56.99 Only 7 left! Size 6 - £56.99 Only 8 left! Size 7 - £64.99 Only 6 left! If you're looking for an ancient style from head to toe, start with the toes! These rustic boots feature beautiful beading at the top with a dangling string of beads down the side. 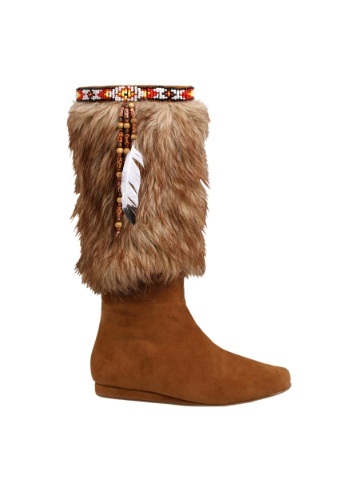 These adult brown boots are even covered with faux fur for a Native American-inspired look. No look can be complete without the proper footwear and we know these furry boots with accents are sure to make you stand out on the dance floor or at the fair.